A community college just outside New Jersey’s state capitol recently announced it is building the largest distributed solar installation of any college campus in the United States. This announcement is the latest in a long line of renewable projects at American colleges and universities. 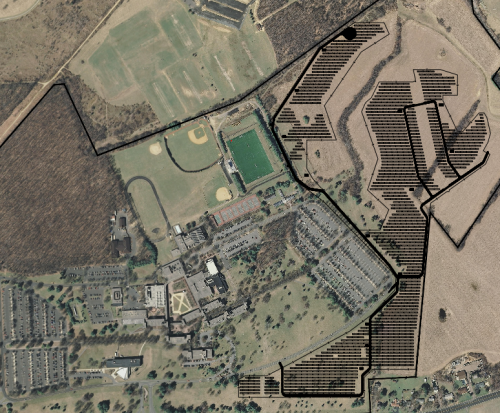 When completed late this year, 33,500 American-made solar photovoltaic panels will stretch across 45 acres of the Mercer County Community College (MCCC) campus in West Windsor, NJ. The 8-megawatt (MW) array is being built at MCCC as part of an innovative 15-year lease-purchase between the school, county government, and solar installer SunLight General Capital. Through the agreement, MCCC will pay SunLight General for electricity generated from the array at a discounted rate of 3 cents per kilowatt-hour (kWh), compared to the 14-cent kWh rate it currently pays to incumbent utility PSE&G. The Mercer County Improvement Authority (MCIA) helped finance the project and will maintain the project title. Once operational, the array will offset 70 percent of the school’s annual electricity demand, saving MCCC an estimated $750,000 in utility costs and preventing 7,500 tons of carbon dioxide emissions per year. Electricity generated on-site will first meet MCCC demand, and then be provided back to the grid through a net metering arrangement with PSE&G. While extensive, the array’s benefits are not limited to cost and pollution savings — MCCC will also use the project to help train green collar workers. Students will study real-time energy output and gain hands-on learning training on PV technology as part of the school’s alternative energy and sustainability curriculum. New Jersey has the nation’s second-largest solar market, and more than 76,000 green jobs exist across the state, according to the U.S. Bureau of Labor Statistics. “Such learning opportunities will break new ground in community college education, preparing students for a world that is moving further away from expensive, dirty fossil fuels and closer to clean, renewable sources of energy,” said Dr. Guy Generals, vice president for academic affairs. MCCC’s lease-purchase agreement may help maintain the project’s value, even as the solar industry faces strong headwinds in New Jersey. Austerity measures have forced the state to consider cutting back solar subsidies, and the state solar renewable energy credit (SREC) market has created an oversupplied market, reducing anticipated payments many public entities relied upon to finance their projects.